Advanced IP camera with sensor outputs and 16G memory. Professional high resolution full size box-style camera with C/CS lens mount, dual power capability and dozens of advanced features. Indoor high resolution color dome camera with built-in infrared array. Board camera for kits and do-it-yourself (DIY) CCTV camera projects. Contains auto-iris control. Outdoor bullet camera with vandal-resistant case and built-in infrared array. 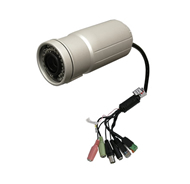 Outdoor high resolution bullet camera with varifocal lens and built-in infrared array. Outdoor bullet camera with infrared LED array. DVRs with MAC-compatible streaming video.